Every boxer knows that an injury, no matter how small, can end a fight or even their career! So, think first, prepare, and allow KO Tape to protect your tools. The 2.5cm tape is the standard size, that is used by almost all boxers and hand wrappers. The non-elastic, rigid tape has a smooth unwind to give professional hand wrappers a controlled application. The tape unwinds all the way to the core, so there is absolutely no wastage. When you step into the boxing ring, whether you’re sparring, doing pad work or fighting, your gloves may cushion some of the impact of your punches, however, this on its own is not enough. KO Tape is a rigid zinc oxide tape that provides directional support and immobilises the small joints and bones in the hand upon impact – and so prevents any injuries. If you have never worn hand tape before and you haven’t had hand or wrist trouble, you’re wrong. Your hands are already suffering with wear and tear because of the lack of protection. The next time you do through a punch without the correct protection, could be the last! 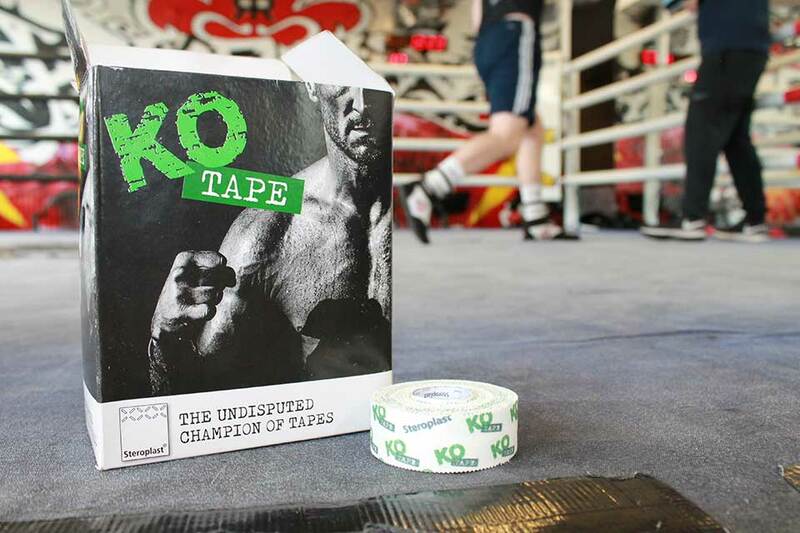 KO Tape allows you to unleash your full power with every punch, with absolutely NO FEAR of injury.